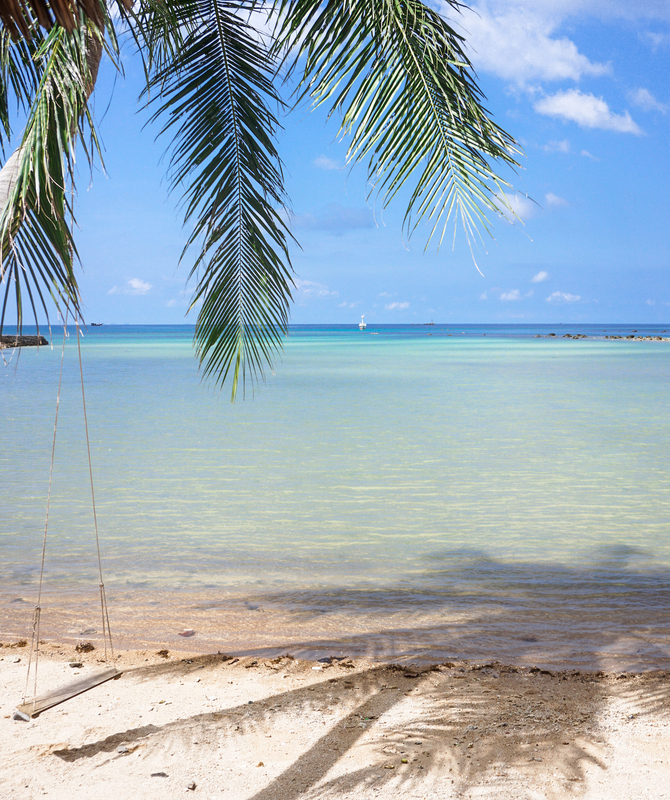 Koh Phangan, a beautiful island in southeast Thailand, is usually known for its monthly Full Moon parties. 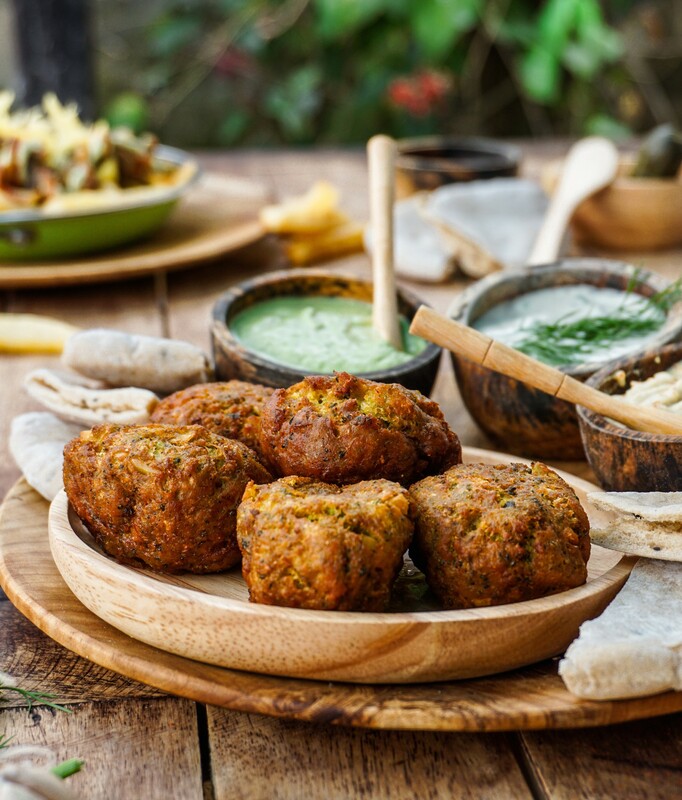 What most people don’t know is that in the north-western parts of the island (specifically the area known as Srithanu) you can find a beautiful community of conscious yogis, expats, travellers and locals that have created a vegan paradise on the island. 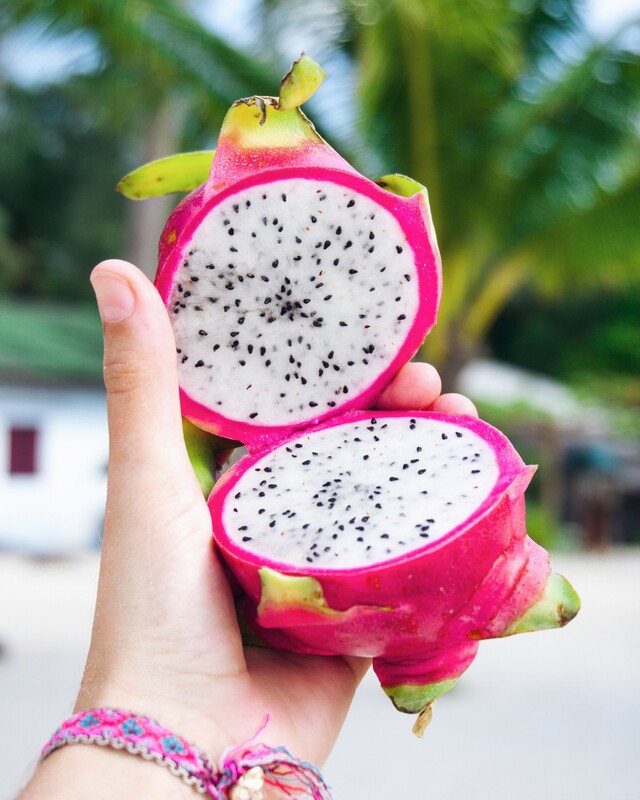 Apart from a vast amount of healthy and delicious vegan food, marvellous beaches, scenic waterfalls, and breathtaking sunsets, you’ll also find some of the best yoga, detox and meditation centres in Thailand, making it the perfect place for health-oriented people. If you’re following me on Instagram, you’ll know that for the past 3 months I have been travelling in Thailand and Japan. 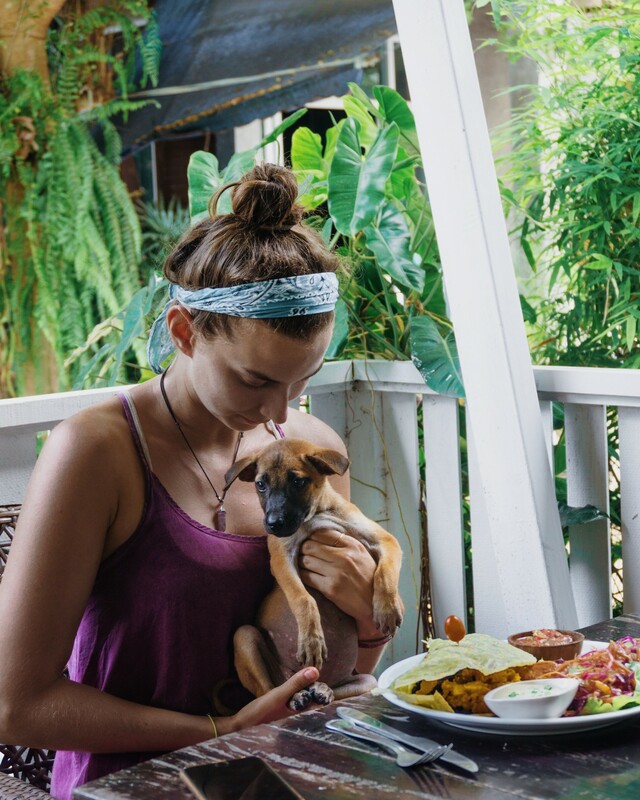 After spending much of that time (1.5 months) on Koh Phangan, I’ve decided to share my experience regarding everything yoga + vegan food in the Vegan Guide to Koh Phangan. 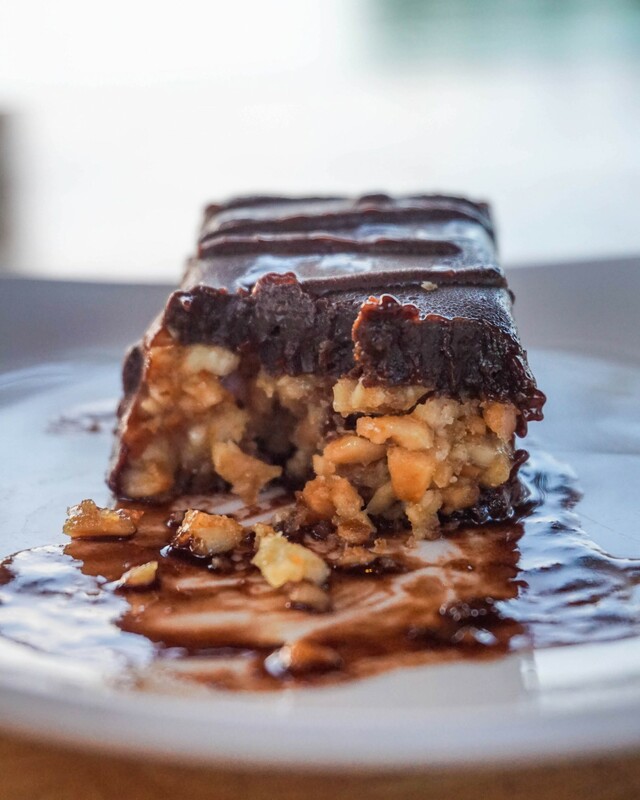 While there are many vegan restaurants spread over the island, the area of Sri Thanu in the north-western part of the island, has by far the best and most concentrated amount of vegan eateries. You’ll find that the north-west, where I spent most of my time during those 1.5 months, offers anything from a relaxing atmosphere, high quality yoga and detox retreats, picturesque beaches, incredible sunset jams, diving schools, and a beautiful community of curious travellers, locals, digital nomads, expats, and overall health- and spiritual seeking people. 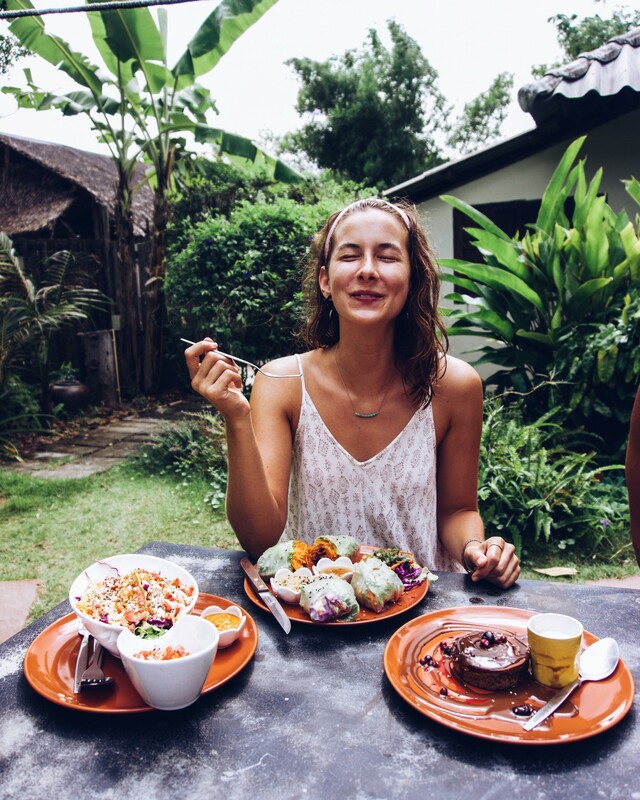 The following vegan guide to Koh Phangan includes a list of my favorite vegan dishes + restaurants. While you can find many more places, these are my absolute favorites and well worth a visit! 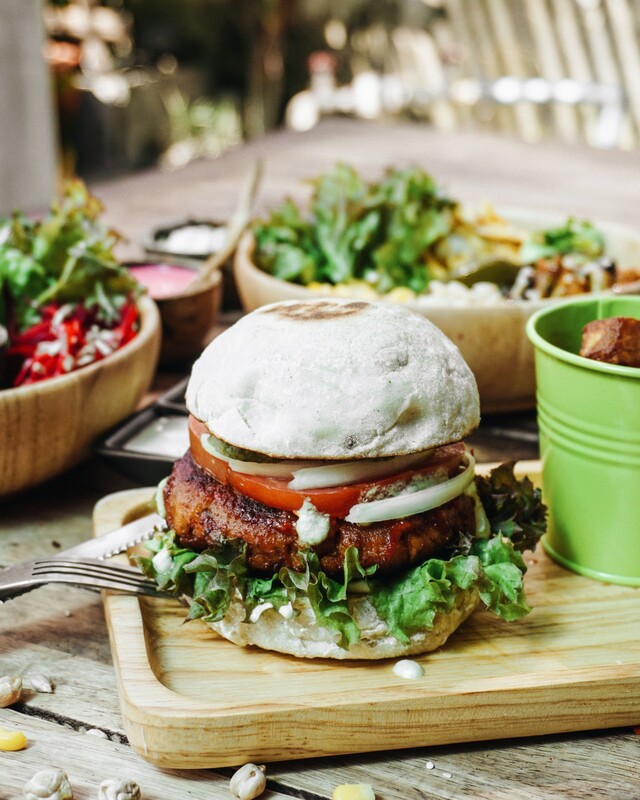 Of course I didn’t visit every vegan restaurant there is on the island, hence I’ll add a list of the ones I didn’t try below. Since one of the most popular questions I get is where to stay on this beautiful island, I’ll lay out a few of my favorite places below! Personally I preferred staying in guest houses/bungalows that are close to the beach, rather than hotels. It’s such a pretty island with food abundance that you won’t spend much time at home anyways so I always prefer spending my money on food and activities rather than a fancy hotel! 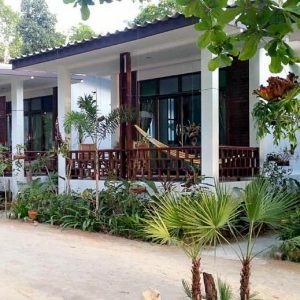 Seaview Rainbow ≈$25: this is a bungalow style guest-house right on the beach! I stayed here for almost 2 weeks with my boyfriend in one of their fan bungalows. Their location is unbeatable, as their not only right on the main Srithanu beach but also just in the middle of all the best restaurants and coffee shops! You’ll pay about $25 per night but if you stay for longer than 2 weeks you might be able to bargain with the owner. Benjamin’s Hut ≈$38: beautiful bungalows right on the beach with a nice balcony, hammock and outside sitting area – perfect for breakfasts with a view! 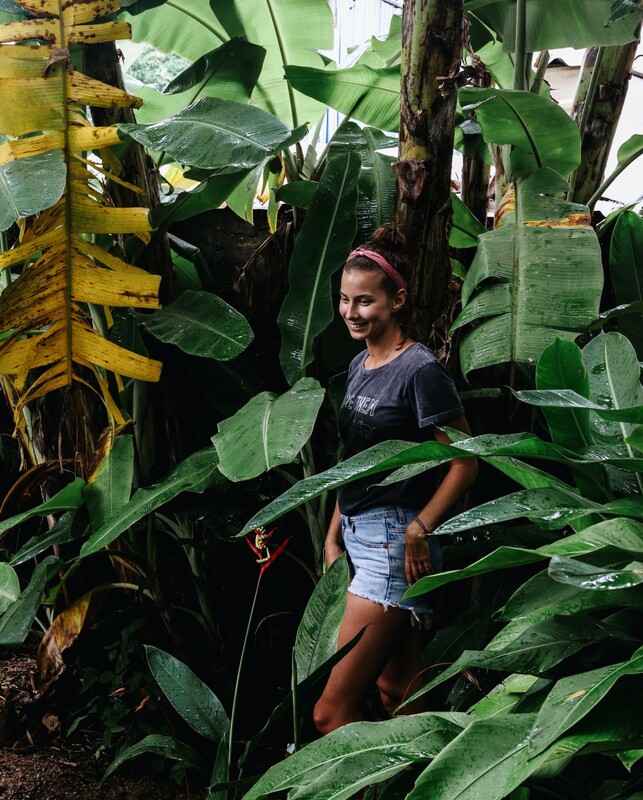 They’re located only short 2 minute scooter drive away from the center of Srithanu and surrounded by coconut trees and tons of lush greens! This is such a fantastic location, right on the beach with super friendly staff and even a small pool to chill and refresh! There’s tons of local shops and a minimart around to shop for quick supplies! Loyfa Natural Resort ≈$44: cutely designed bungalow style resort, located just next to my favorite yoga place Orion. This one is a bit more secluded located right on the beach front surrounded by lush greens. They have 2 outdoor pools overlooking the beach and a beautiful relaxing area. It takes about 5 minutes by foot to reach the center of Srithanu which is perfect! Eat.co is definitely a must-go when on the island! 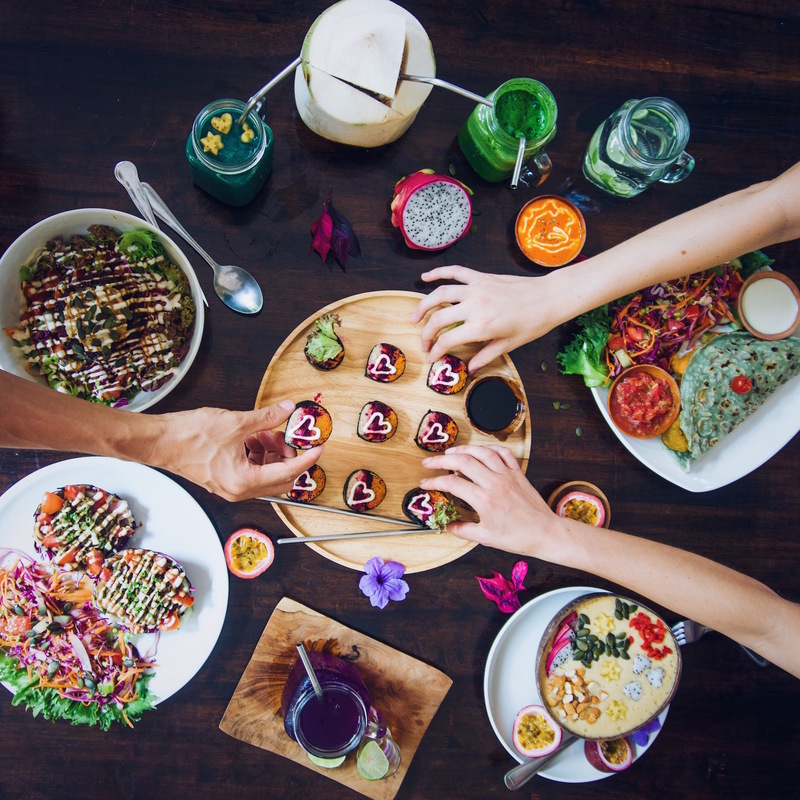 It offers the perfect selection of vegan comfort foods, healthy smoothies, lunch bowls and scrumptious desserts. The owner Kinga is the sweetest Polish woman who came to the island and created a little piece of (vegan) heaven with this restaurant. During my time there I literally went to Eat.co every second day, just because their food is incredible and the whole vibe in the restaurants is so relaxed and fun. The vegan ramen is one of the best (if not THE best) I’ve ever had so far. It’s so incredibly flavourful, packed with tempeh, meaty mushrooms, shredded veggies, seaweed, sprouts, rice noodles and all the goodies! YUM! Just thinking about it now makes me crave it. 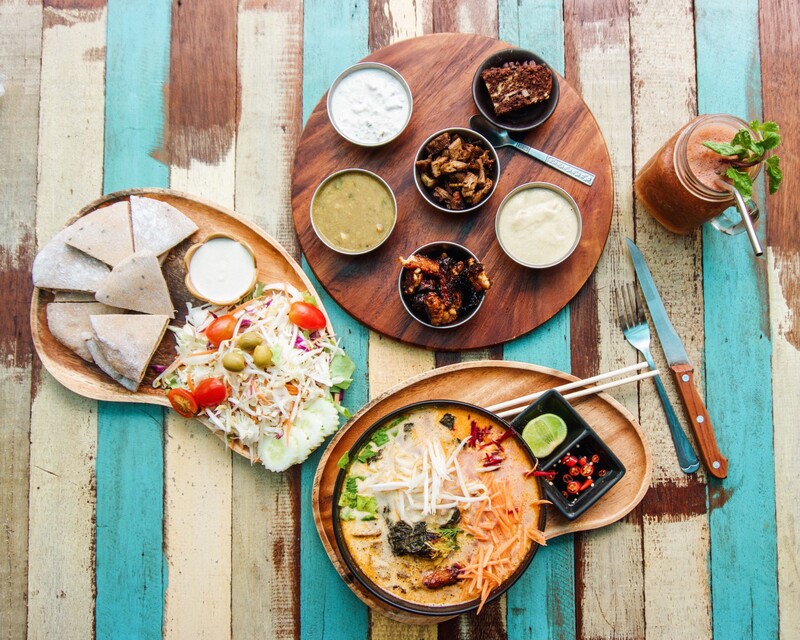 Apart from the ramen, make sure to try the Burmese salad (no msg and so so good), the meaty mushrooms on brown rice (out of this world), the mushroom burger (just look at the picture), the thali platter (all the good stuff on a plate with amazing dips), the Mexican bowl (think guac, tortilla chips, brown rice, corn, beans, salsa), cheesy kebab chip bomb (name says it all – for those comfort food days), and the dhal with naan. Just before I left the island they also opened for breakfast with an absolutely mouthwatering new menu, so make sure you try also the quinoa porridge and some of their new breakfast goodies (I wish I could’ve tried them all). My personal dessert favorites were the coffee ice cream (so so creamy), Oreo cheesecake, apple crumble pie with vanilla ice cream, banoffee pie, and the mango millet cream pie! 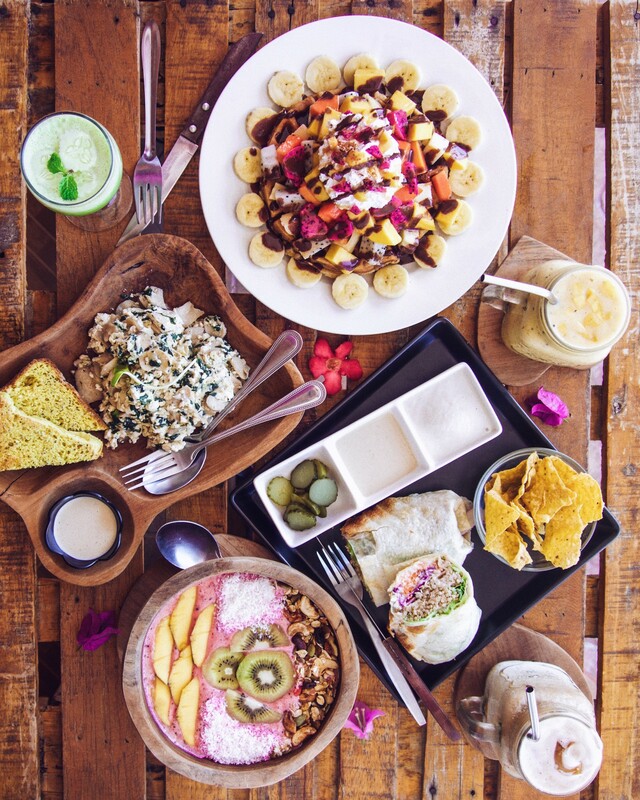 As if one amazing vegan restaurant isn’t enough already, Eat.co also has another branch in Thong sala (just by the pier) that focusses on breakfast and lunch goodies! I’ve come to eat here every time I had to catch a ferry or was in the area. Excellent excuse to spoil yourself with some comfort food. The space is much smaller than their main restaurant but the menu is equally amazing! In case you’re in the area, make sure to try the vegan waffles (with coconut whip), scrambled tofu, smoothies, wraps and baguettes. Just on the last day before catching the ferry to Koh Samui, I ordered this crazy scrumptious meaty mushroom baguette, which was huge and unbelievably delicious! Everyone on the ferry envied me for having it, while I was struggling to stay somehow civilised and clean while eating it… haha! Talking about favorite vegan restaurants, this gem is way on top of the list! 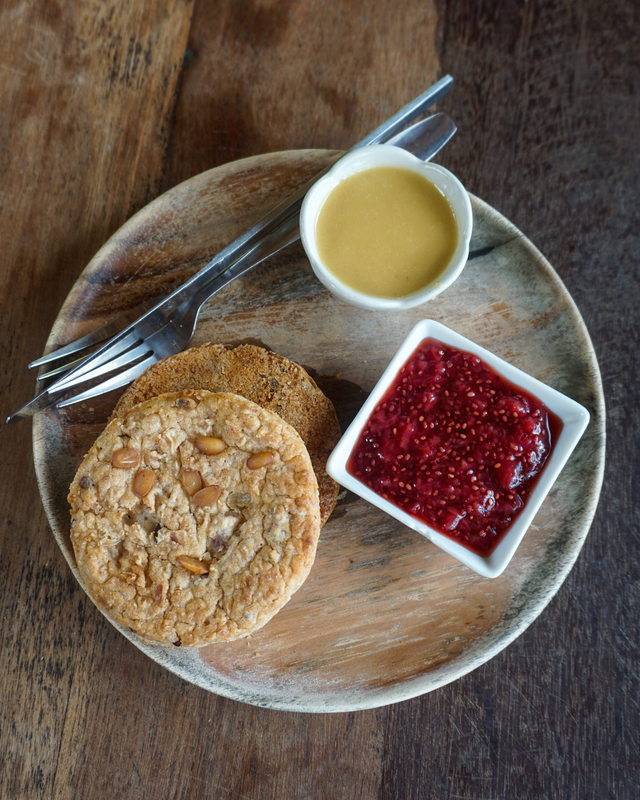 Karma Kafe is perfection in its simplest forms. Everything from the delicious vegan food, the beautiful space, relaxed vibes, and super friendly staff is going to make sure you’ll leave satisfied (and probably come back)! 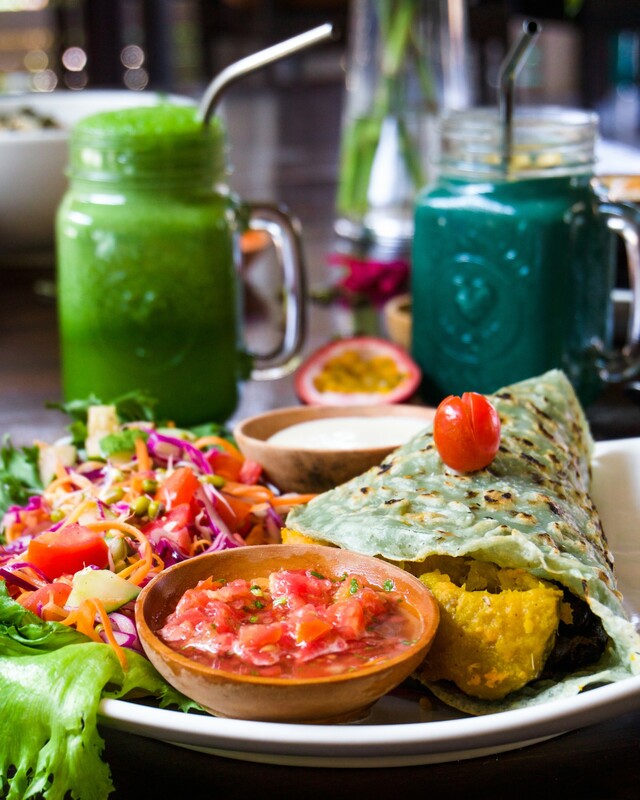 The food at Karma Kafe is incredibly delicious and you’ll find plenty of wholesome healthy options to choose from. And just in case you’re looking for an allergen-friendly restaurant, you’ll find anything from raw to gluten- and refined sugar-free. Their signature burrito is out of this world and I’ve been missing it ever since I left the island. 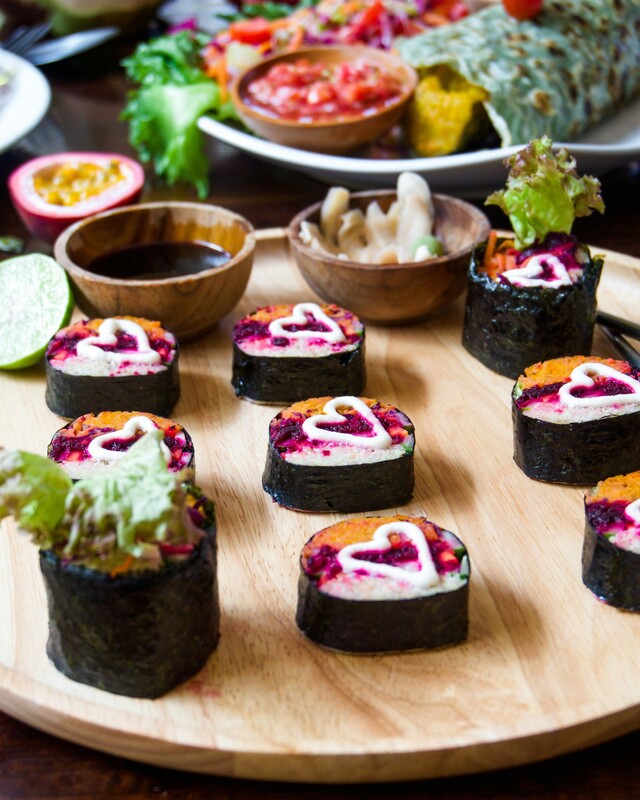 Think spirulina tortilla, filled with the best organic goodies like pumpkin, black beans, and sweet potato, topped with creamy cashew cheese, salsa and a side fresh salad! Words cannot describe the joy every single bite of this beauty has given me! 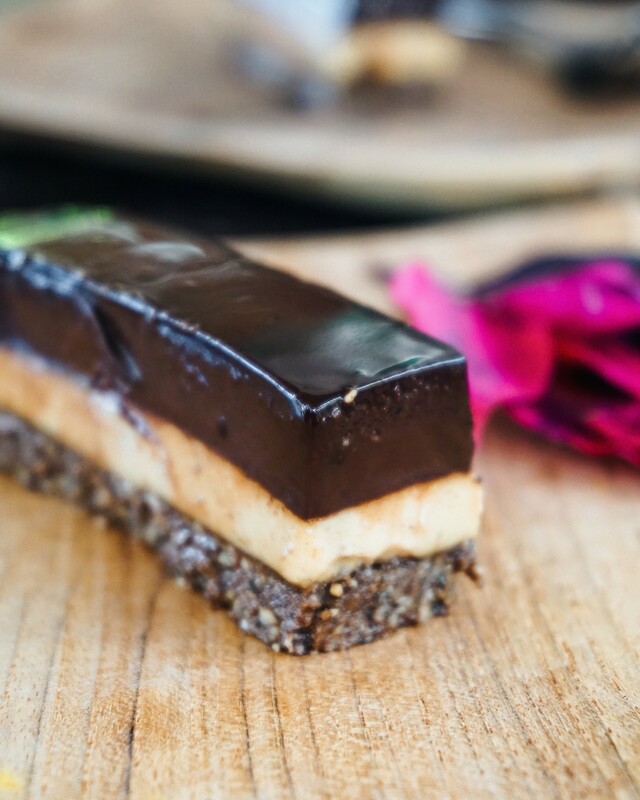 If you order it, make sure to get it with crispy tempeh for some extra goodness in your life! Some of my other favorite dishes include the Malibu sushi, the Kalifornia bowl, the quesadillas, the pesto bruschetta and, most importantly, the pumpkin soup with garlic bread. I’m one of those people that would never ever order a soup in a restaurant, just because most soups don’t fill me up, are not really amazing and I end up having to order another dish. BUT, this pumpkin soup completely changed my mind about soups. Up until now I still don’t understand how they make it so good, but the soup is so incredibly creamy and just melts in your mouth. The combination of the garlic bread (gimme all dat!) and the soup is just next level. Just do yourself a favour and try it! It’s plenty and will definitely leave you satisfied! 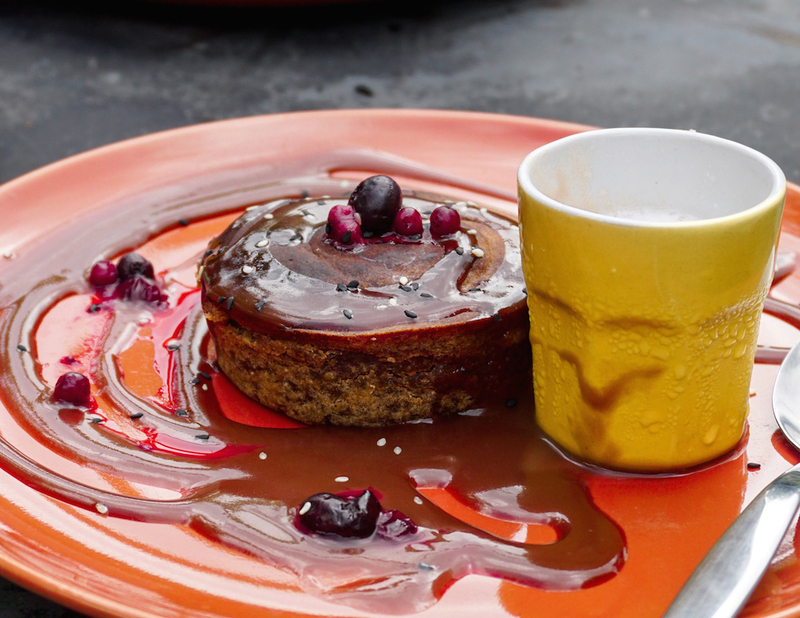 Also, if you’re left with some space, make sure to try the desserts! My absolute favorites are the mint ice cream (or any of the other flavours really), the chia parfait (doesn’t look like much, but secretly it’s this most amazing lemony cheesecake), the carrot cake (make sure they warm it up for you), and really any of the other ones…. they’re all amazing! Pure Vegan is definitely one of the places with the most beautiful setting on the island. Once you enter the place you find yourself in this very relaxing garden setting surrounded by lush jungly vibes and wooden signs with affirmations. It is one of the only places (if not the only, not sure) that serves a decent açaí bowl and some other goodies when those cravings hit. My personal favorites from the menu were the sweet potato gnocchi, açaí bowl, quesadillas and the toffee pudding is INCREDIBLE! Orion Healing Centre is not only a well-known yoga/detox retreat center on the island but also has one of the best locations/views and great food! It’s one of my favorite places to come and work from, spent the morning or just relax after one of their yoga sessions. If you’re on the island and have the time and money, make sure to take the 2 hours morning yoga class with Ben! Until today one of my absolute favorite yoga classes ever! Orion is located in a beautiful bay, offering divine ocean views and the perfect environment to just chill in a hammock, and enjoy some good food! Some of my favorite dishes there include the hummus with za’atar (literally the best hummus I’ve had outside of Israel), their gluten-free bread with peanut butter and chia jam, the homemade granola bowl with coconut yogurt, the meaty mushroom burger, the cheezy ‘shrooms wrap and, last but not least, their signature papaya! Also, do yourself a favor and try the vegan snickers! 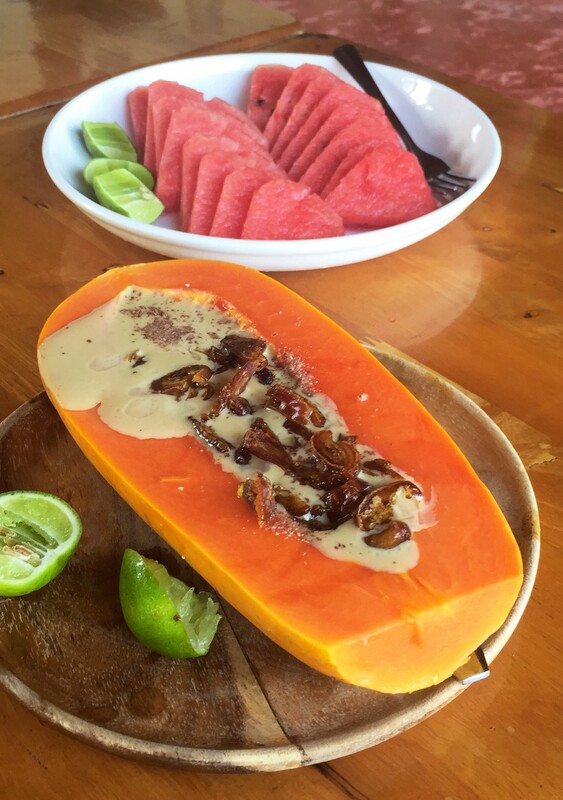 I’ve never even thought about it, but turns out, that tahini, dates, lime and papaya are a match made in heaven! Who knew? 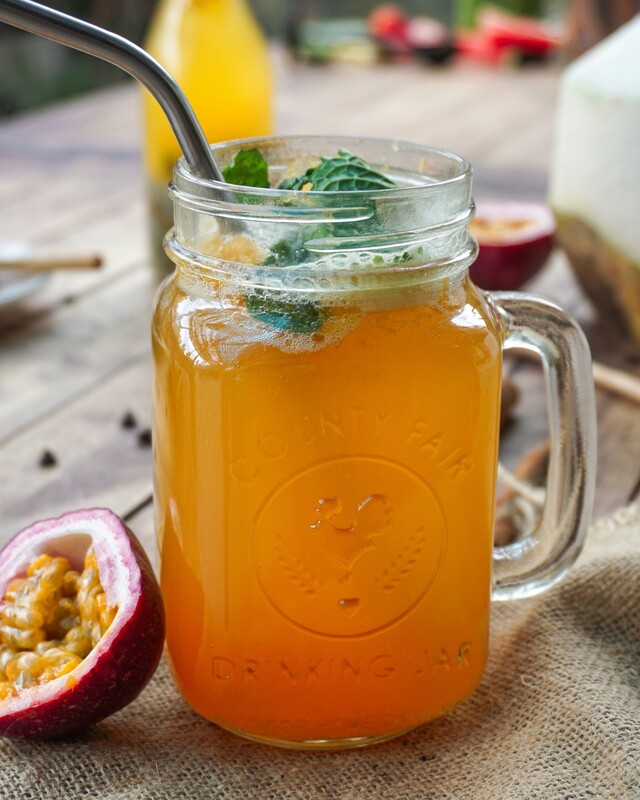 So so good for digestion and the perfect way to start your morning! Orion has amazing healthy vegan food and they even offer a full detox menu for those who came to the island to do some cleansing. 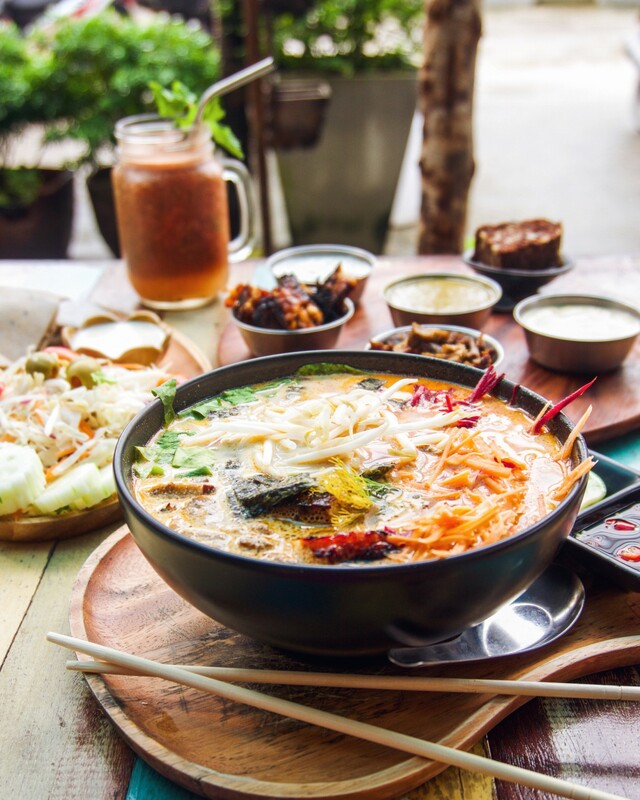 While most of the above mentioned eateries are rather expensive for Thai standards, there are a few gems on the island that serve delicious vegan food for cheap. Aree’s is one of those. Here you can find a delicious vegan buffet full of flavourful Indian food, homemade kombucha and healthy desserts (excuse the low quality phone picture). For 150thb ($4.5) you can fill up your plate with as much food as you want, including naan, curries, rice, dhal, etc. It’s simple, healthy, delicious, home cooked and the perfect place to eat on a budget! Art cafe is another beautiful place, located half in the jungle, with beautiful interior design and relaxing vibes. 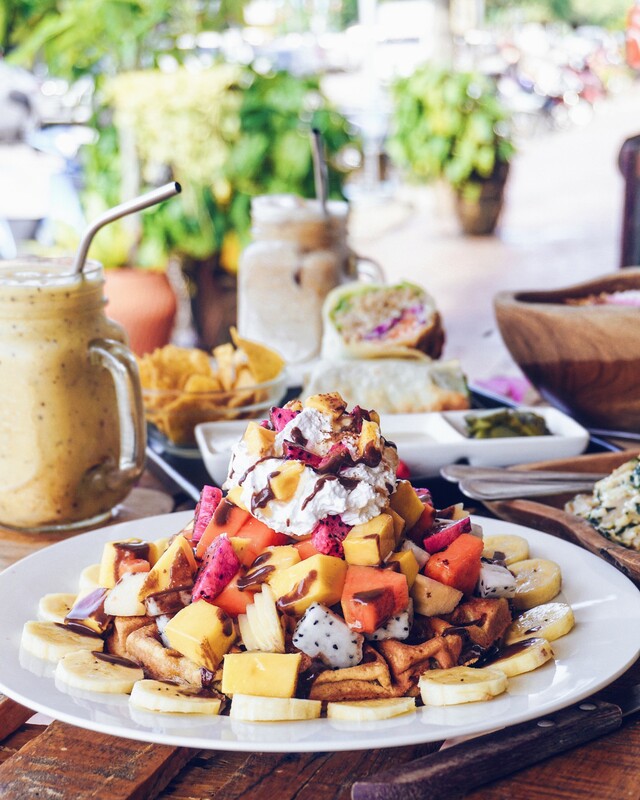 They have the BEST smoothie bowl on the island and offer a lovely atmosphere to work or have a nice breakfast. 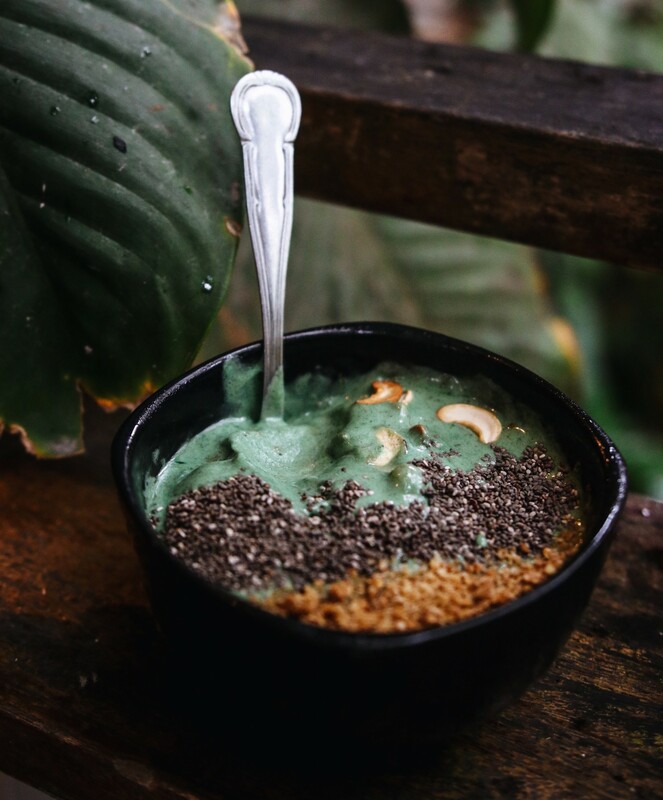 The protein bowl has a really thick consistency (like nice cream) and is filled with goodies like spirulina, peanut butter, bananas, etc. 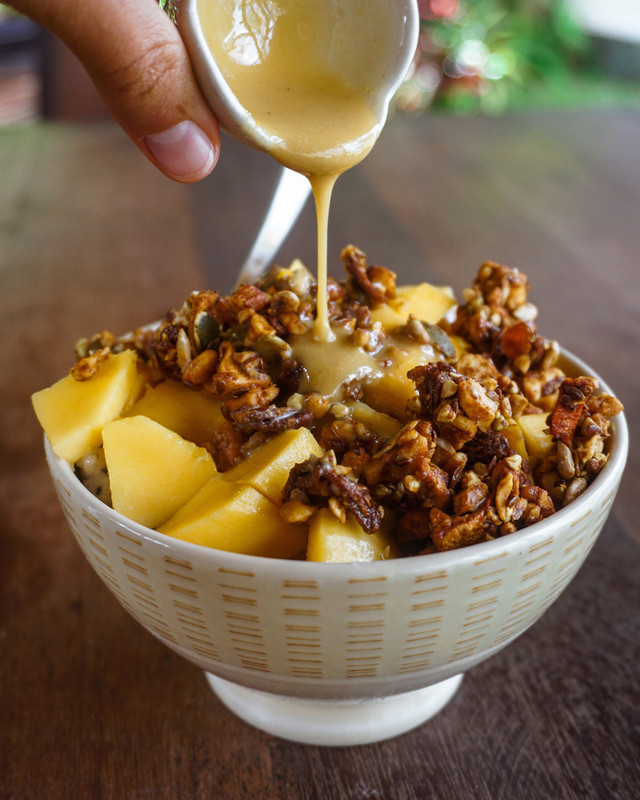 You can choose your toppings but my favorites are chia seeds, granola and cashews! YUM! Apparently their fresh spring rolls are also amazing but I never tried them, so I couldn’t say. One of my absolute favorite places to eat amazing vegan Thai food is Soul Organics. If you want high quality organic food that’s cheap and really delicious, make sure to pay them a visit. Soul Organics is located inside the Pantip Food Market in Thong sala, but well worth the drive (or if you’re in the area). My absolute favorites are the Massaman curry, the green curry, the tom yum soup, and the pad thai! They use much less oil than other places and their produce comes fresh from the organic garden. 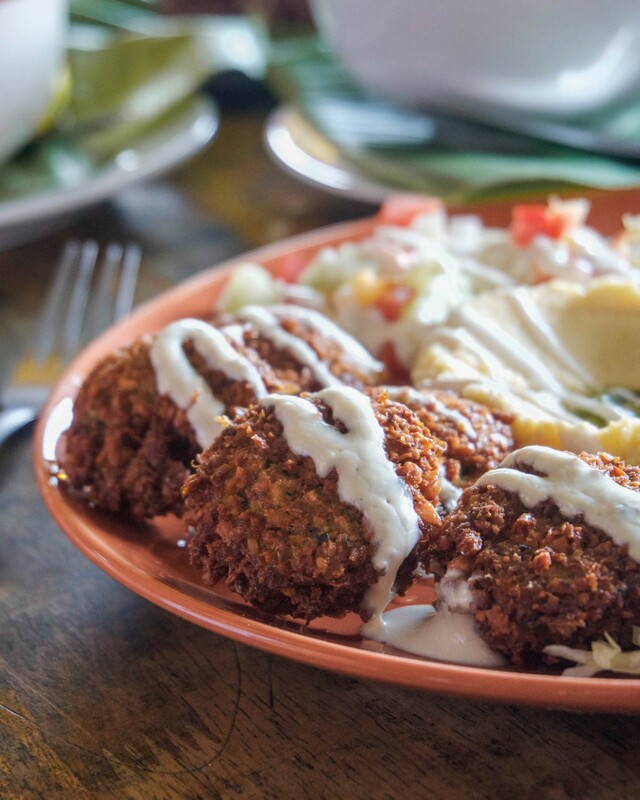 Also located in the Pantip Food Market you’ll find an Israeli place with great hummus and falafel! An all vegetarian Israeli restaurant with a really nice outside sitting area, great food and friendly staff and owners. As my boyfriend is an Israeli living outside of Israel, he gets extremely excited about homey Israeli (Arab) food, and definitely wasn’t disappointed when we went here. 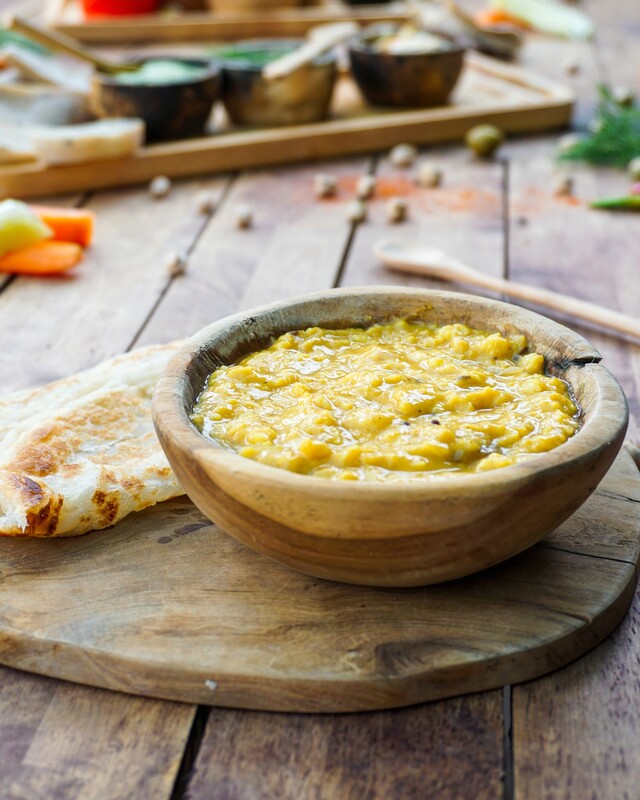 Choose from a variety of hummus, falafel, babaganoush, shakshuka, fresh pita, sambusak, burekas and whatever brings joy to your heart! Most dishes can be veganized if you tell them. They also have some really nice juices I can highly recommend! Ever tried macrobiotic food? No? Well you should! Akasha is a small but lovely restaurant on the road into Srithanu featuring mostly organic and macrobiotic food. The food is very simple, super healthy and surprisingly yummy. It was my first time eating macrobiotic food and it was so delicious. The restaurant is run by this really nice Greek guy and his wife and they also sell their own packaged spices, oils, homemade snacks, clothes and natural health products. The food is really delicious, including read rice, steamed veggies, very little seasoning, macro bowls, soups, sandwiches and really yummy bread. I feared that it would be rather bland and tasteless but it’s really the opposite! Nice restaurant on the road leading into Srithanu. They have some vegan baked goods, Thai food and lots of juices. Apparently their pizza is a thing but I never tried it. Really liked their lab tofu mushrooms and steamed spring rolls! Also they have really good ‘mocktails’ that you should try! 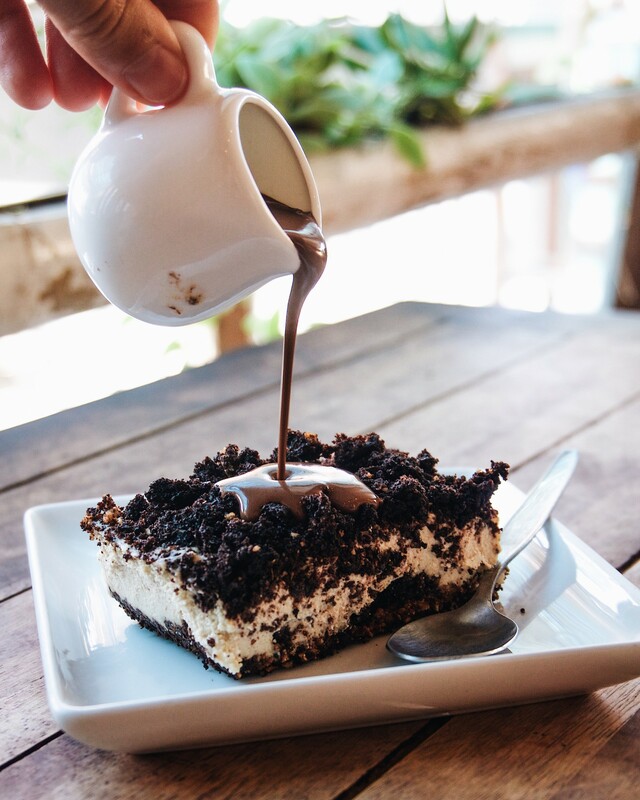 If you’re looking for some healthy supplies like homemade coconut yogurt, granola, kombucha, and vegan treats like bliss balls and cookies, make sure to check out the organic shop in Srithanu. It is a small shop located between Eat.co and Karma Kafe (next to the atm machine, there’s usually and older man sitting inside). The shop doesn’t really pop out but it’s worth a visit! 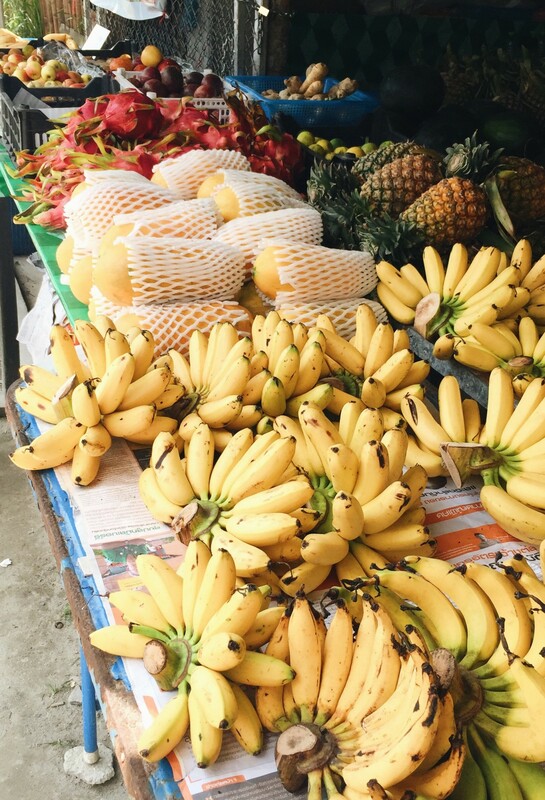 Last but not least, one of the best things food-wise on Koh Phangan (and probably all Thailand) are the local roadside fruit stands where you can buy tons of cheap, ripe fruit. Those were my go-to breakfast almost every morning. 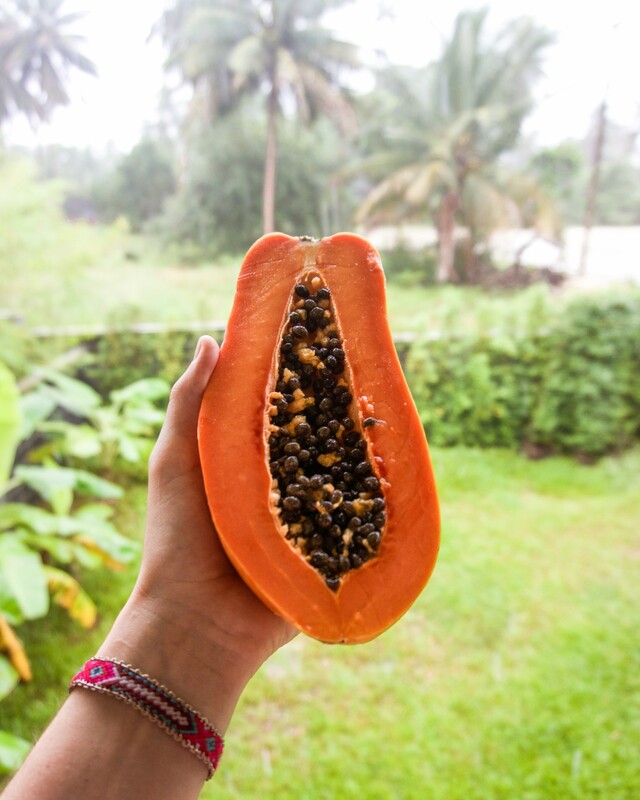 I became obsessed with papaya, passionfruit and lime (great combo), tried durian for the first time in my life (not yet loving it), ate maybe 50kg of juicy mangos, had a coconut a day and tried mangosteen and absolutely LOVED it! Funnily enough, I’ve never really liked papaya, it always kinda tasted like old socks to me, but then again I guess I never had a real one. Ever since I tried the local ones I’m in love and eating it all day everyday! Thank you so much!!!! Wow…who knew? Do you have any suggestions as to where to stay there? Plus this post makes me salivate now and I was considering boing to Bali for a month but now I see that Koh Phangan might be even better. Could you please tell us more about the cost of living there and how did you find good places to stay? Cost of living vastly depends on your needs and travel season. I went there December – mid January which was kinda high season, so I paid more because prices climb from December-February. I organised a 1 bedroom house (including kitchen) for the first month and paid $370 per month. But I know that you can find cheaper. My house was perfect though, really fast internet, all amenities and a 5 minute drive (with scooter) to the beach. 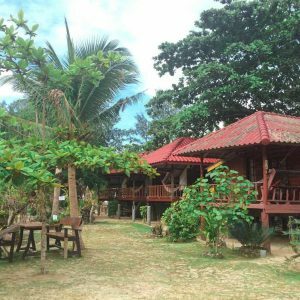 For the last 2 weeks I stayed in a beach bungalow and paid $20 a night (no kitchen). So as you see it all depends on what you want. I’ve spent around $10-12 per day on food, sometimes more, sometimes less. You can greatly reduce costs if you have a kitchen at home. For breakfast I always had either fresh fruit (papaya + coconut, passionfruit, mango, etc), porridge or avocado toast (if I found a good avo). That’s around $3. For lunch I mostly went to a cheap local Indian/Thai place with yummy vegan food where you pay $2-3 and for dinner I’d ‘spoil’ myself with one of the more expensive vegan places where you pay around $5-6 per main dish. If you stay longer on the island you’ll probably also want to get a scooter which was $2-3/day (you get bargains if you take it for more than 1 week). Nice article, well presented especially with the additional tips on where to stay. Thank you so much for sharing all the information you found and experienced. The place looks and sounds like real paradise and I hope I can organise a trip for us in a near future. Thanks! I’m sure you’ll love it in case you make it there! Awesome thanks so much. So much great information here. Check out the other comments! 🙂 A lot of people have asked more detailed things about staying there, I’m sure a lot of questions will be answered there! Thank you very much for the informative wrap of the island. I am super keen to take my girlfriend there for her 30th birthday and go on a Vegan restaurant crawl, as such. Question, where did you stay? I’ve found a few places, but wondered about your personal experience with this, being there for 1.5 months. Thank you for sharing this wonderful tour of what looks and sounds like an absolutely fantastic island! …the cost of living. I hate to bring money into something as wonderful as this, but there you have it. What would you say is the average cost of living there that you have experienced? Don’t worry about conversion to US dollars if you’re unsure – I can handle that on this end of things. I just would like to know what I can expect so that I can start planning NOW instead of being surprised LATER. Hey David! 🙂 Wow, that sounds like quite the adventure! Great plan though, I know of a lot of people who chose Koh Phangan to retire because it’s just a beautiful island that offers a bit of everything! I’ve spent around $10-12 per day on food, sometimes more, sometimes less. You can greatly reduce costs if you have a kitchen at home. For breakfast I always had either fresh fruit (papaya + coconut, passionfruit, mango, etc), porridge or avocado toast (if I found a good avo). That’s around $3. For lunch I mostly went to a cheap local Indian/Thai place with yummy vegan food where you pay $2-3 and for dinner I’d ‘spoil’ myself with one of the more expensive vegan places where you pay around $5-6. If you stay longer on the island you’ll probably also want to get a scooter which was $2-3/day (you get bargains if you take it for more than 1 week). Let me know if you have further questions. The monthly rental rate is quite high by the way as it was high season, but especially if you sign longer contracts for a year let’s say you can get really cheap prices and amazing houses! Best is to fly there in low season for a few weeks and check out the area, you’ll have great chances to find the best houses and deals! Hi, it looks beautiful there. Are the puppies shown in the video all stray on the island? What is the general vibe towards the stray dogs? I know a lot of places treat them as vermin. How is it on this island? We have just returned from Koh Samui on 13th Feb and now wish we had gone to Koh Penang although Samui was amazing too – gives me a reason to go next time ! Great article ! Awesome photography and I love the video! This conscious island truly is amazing. I’ve been living here in the winters for a few years and I’m always amazed at the quality and variety of vegan and vegetarian food. Thanks! 🙂 Right? I didn’t know when coming there and was so positively surprised! You can find something for anyone on this island! Wow this place looks like a vegan paradise! 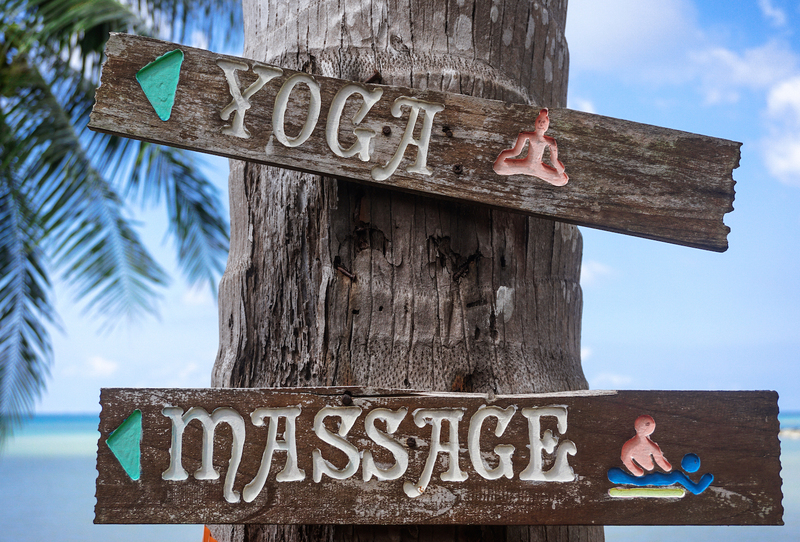 Other than eating and yoga classes, what were some of your favourite things to do here? Are there many sites to see? This is amazing. I have yet to make it to Koh Phangan, but it’s inevitable that I’ll get there sooner or later. 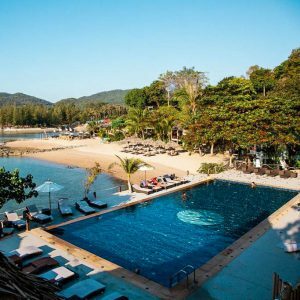 As a vegetarian traveler, I always appreciate having lots of veg options, so Koh Phangan kinda sounds like paradise to me. It actually reminds me a whole lot of Bali, where I’ve spent a lot of time living (and eating!). I’m definitely bookmarking this post. Thanks!! I would love to receive the information necessary to plan a group trip for 2019. It all looks amazing. Try reading the other comments first 🙂 I gave some more information there! But feel free to ask me any other specific questions you might have! 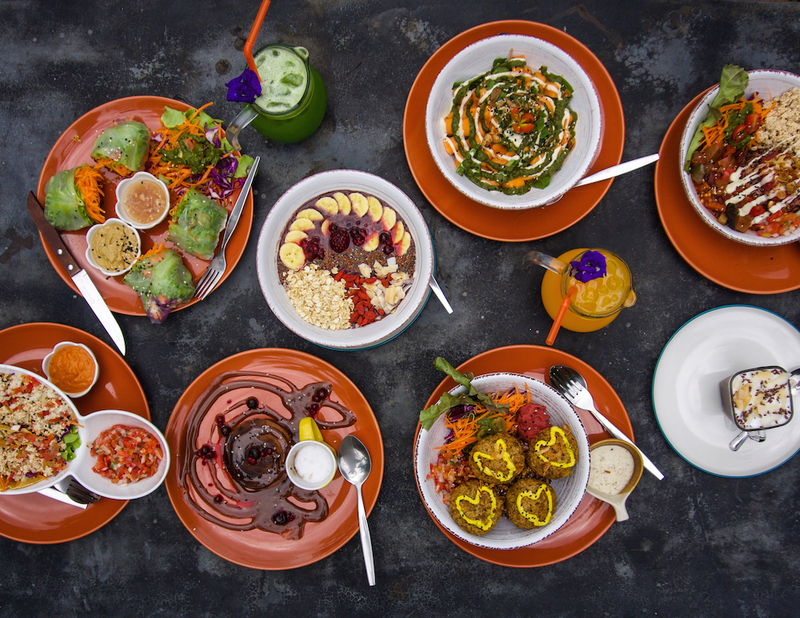 You missed one really spectacular restaurant – Green Gallery, an all-vegan place owned by two Israeli sisters just opposite Agama Yoga. Also Seed to Feed is wonderful! Your place looks delightful. I would like to visit and stay the end of this year December. Go for it! 🙂 It’s an amazing island! 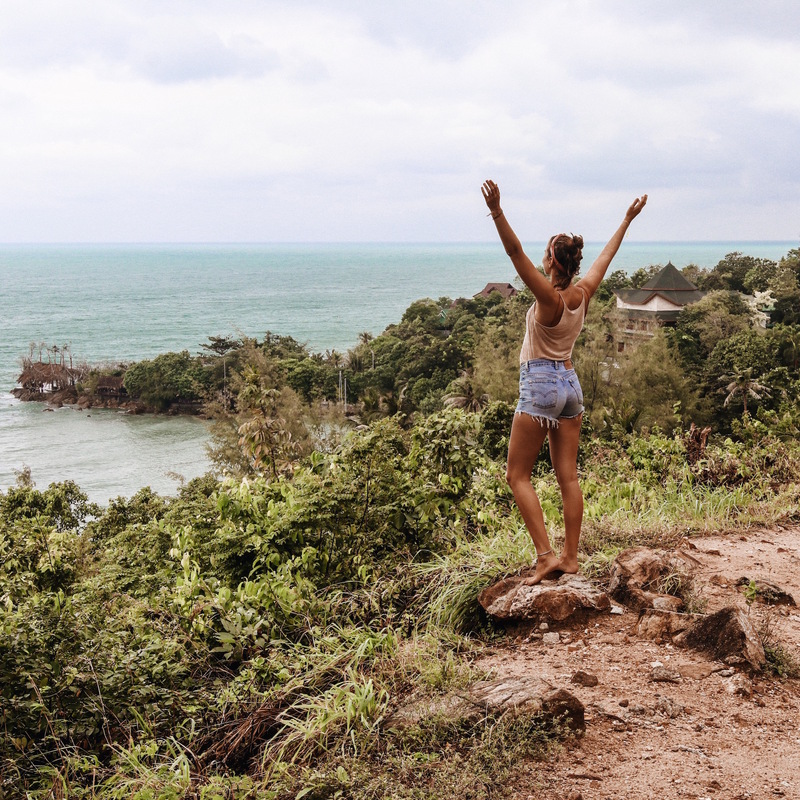 This article actually made me book an upcoming trip to Koh Phangan! Thanks so much for this awesome piece of writing. I am so excited to experience this all in real life. What is the closest airport you fly into? Suratthani or Koh Samui and then take the ferry over from there! 🙂 I took the night bus from Bangkok and then the ferry – also an option (and much cheeper)! Hello! This sounds absolutely glorious. 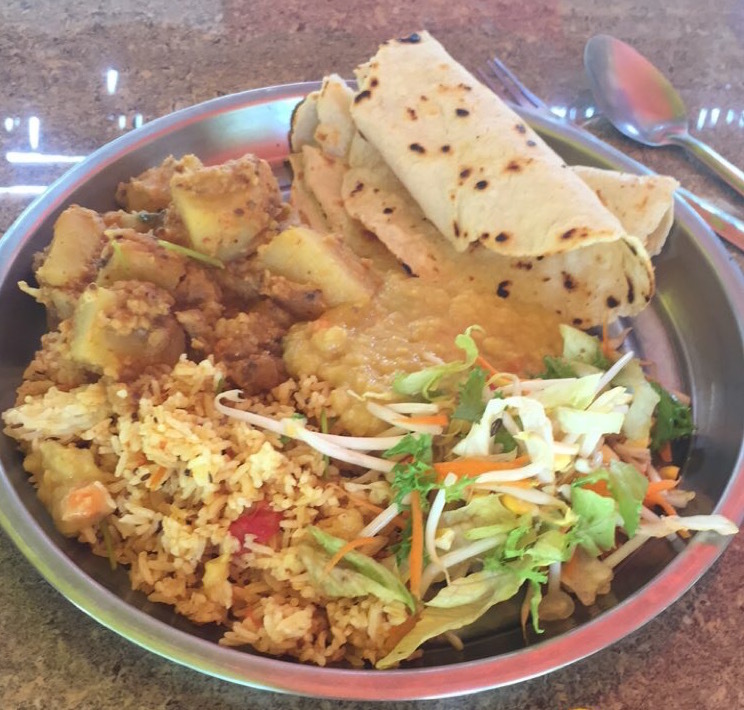 I know you mentioned that this is vegan paradise is the product of locals, travelers, and expats, but did you happen to notice how much the locals were involved? I’ve been to places like Rincon, Puerto Rico, which is a very pressed-juice-and-yoga-loving area but the vibe is very much that surfers from the mainland U.S. came and sort of took over. That’s why I’m curious as to whether it’s a collaboration or more of non-locals “taking over” the island. Thank you so much for sharing this paradisal adventure! Hey Brie! 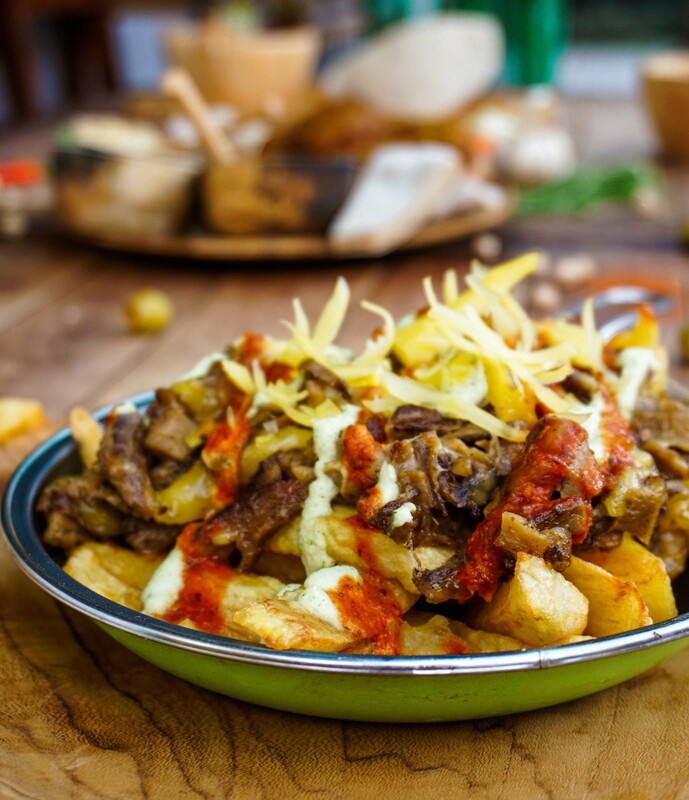 From my experience it’s definitely Westeners coming over who started this, but due to the high demand more and more local restaurants are involved to to cater the demand. 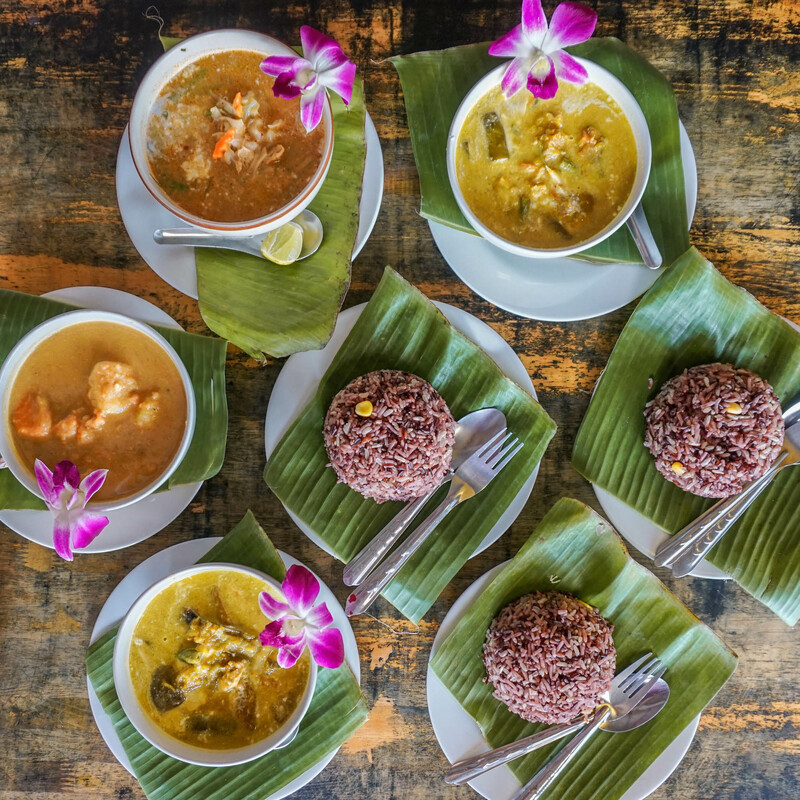 This includes not only vegan restaurants run by locals (which are always much cheaper than the ‘fancier’ vegan Western food on the island), but also a few Thai yoga teachers and local initiatives to reduce plastic. It’s still a minority and slowly growing but awareness is spreading and oftentimes it’s also a simple supply-demand situation. Thank you so much for this post. If has been very insightful. I’m vegan since an half a year and reading this makes me very keen to go! I’ll be there from 13th of December and I will stay 1,5 month as well since my boyfriend will settle down there for some digital nomad work. Do you have any tips what I could do during the day while he is working? I was thinking about some volunteering or working. I’m a teacher but I also have lots of experience in hospitality. Of course there is enough to do and to relax, but I’m afraid i’ll get a bit bored after a while. I hope you have some ideas for me to keep myself busy. 🙂 thank you!